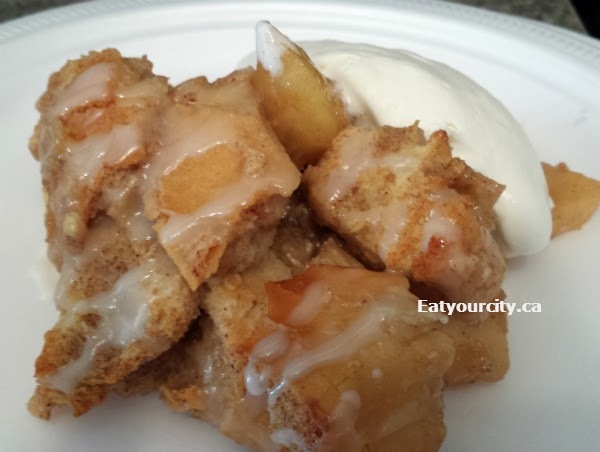 Eat Your City: Apple cinnamon bun eggnog bread pudding with vanilla icing baked or in slowcooker / crockpot recipe! Part 7 of Breakfast and brunch series! 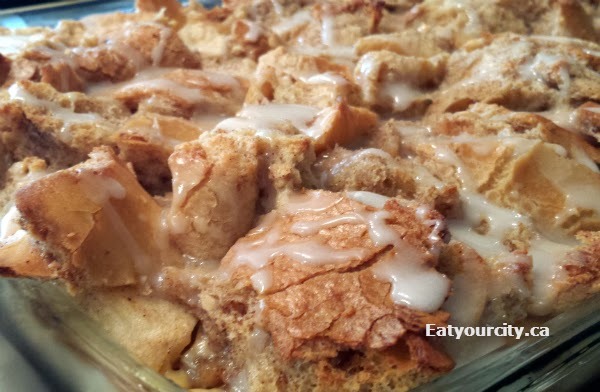 Apple cinnamon bun eggnog bread pudding with vanilla icing baked or in slowcooker / crockpot recipe! Part 7 of Breakfast and brunch series! And what can breakfast be if there wasn't a sweet dessert at the end? I've tried this recipe both by baking in the oven in a water bath and in a slowcooker (though you really have to butter the crock pot and watch so it doesn't burn!). Served with a drizzle of vanilla icing, I topped it off with some Chantilly cream for a potluck brunch, but you can easily serve it with a scoop of vanilla icecream too! The key to making this in a crockpot or slow cooker is to butter or vegetable oil spray the heck out of the pot so none of the ingredients stick... and keep a hawk's eye on it as slow cookers and crock pots are variable in how hot they get even on low.. some get pretty hot so they will cook this bread pudding a heck of a lot faster. You can use a smaller 5 quart slow cooker, or a bigger 7 quart slow cooker - both work! If it burns because you weren't attentive, you'll have a not so delectable blackened mess to scrape and toss out (redo-ing this recipe last minute in the oven works, but is stressful if you need the bugger thing for a get together!). You can make this from leftover homemade cinnamon buns (if such a thing exists) or simply buy some unfrosted cinnamon buns from the grocery store... they always tend to be a bit on the dry side even if they're freshly baked... and just cube them up. You want the cinnamon buns or whatever sweet bread you're using to be a bit stale and dry so they can soak up the custard mixture like a sponge. Make sure you grease up your pan or crock pot pot good.. I used my Misto oil sprayer, or things tend to stick and scorch. Peeling all the apples isn't too much of an ordeal if you have a handy apple peeler! And since my boyfriend won't do it.. by apple peeler, I mean one of these apple peelers! I'm spoiled.. I dig it out everytime I have to peel more than 2 or 3 apples since washing it is just a quick rinse in the sink! Assembly is pretty easy regardless if you're using the crock pot or oven. If using oven, pop the completed pan into a shallow pan, then add boiling water to it to create the water bath.. much easier to transfer than one full of boiling water!! Just make sure the bread/cinnamon buns have a chance to soak up all the milk a bit. If using a slow cooker or crock pot, just pop the lid on and set it to low. Then serve warm with some Chantilly cream (recipe here) or vanilla icecream! - vanilla ice cream or Chantilly cream to serve it with! 3. Peel and cube apples. Toss peeled and cubed apple pieces in a large bowl with 1 Tablespoon ground cinnamon, 1/4 teaspoon ground nutmeg, 1/2 teaspoon ground ginger, 3 tablespoons lightly packed brown sugar. Dump the apples into your prepared pan/crockpot. 4. Dump the bread mixture on top of the apples, gently mix with hands so the apples and bread cubes are combined. In the Oven: Preheat your oven to 350F. Place your 9 x 13 pan in a larger shallow pan (I used a cookie sheet with high sides) and pop into oven. 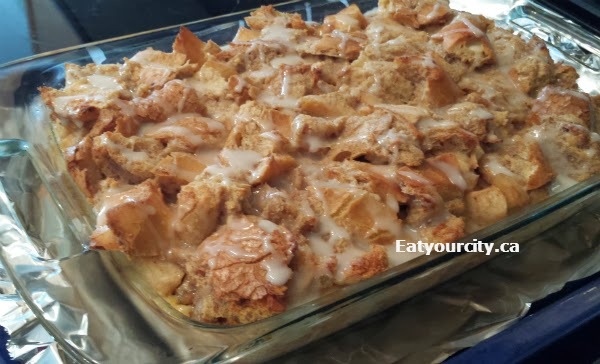 Carefully, add boiling water into the shallow pan to create a water bath - the steam from the water bath will prevent the bread pudding from burning as it cooks. Bake for 35-45 minutes until the custard is set and the top is nice and toasty. 6. Mix the vanilla icing ingredients together in a small bowl and drizzle all over the warm pudding. Enjoy with vanilla ice cream or Chantilly cream to serve it with!